UC Berkeley Events Calendar: Shadow Puppet Faces! 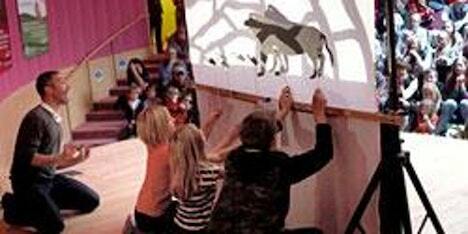 Discover the magical world of shadow puppetry with Daniel Barash of THE SHADOW PUPPET WORKSHOP. In conjunction with current exhibition Face to Face: Looking at Objects that Look at You, Daniel will first introduce workshop participants to the art of shadow puppetry, including numerous puppets from Southeast Asia. Then participants will have the opportunity to make unique shadow puppets that bring the world of faces to life behind the shadow screen. See you in the land of shadows! Daniel Barash, Director of THE SHADOW PUPPET WORKSHOP, has conducted assembly programs, workshops, and residencies at schools, museums, and libraries. He holds a Masters Degree in Elementary Education from NYU, and as a Kennedy Center Teaching Artist, Daniel travels throughout the country leading shadow puppetry arts integration trainings for educators.